Shikoku is the smallest and least populated of Japan’s four main islands, known for its lush, mountainous interior, rugged beaches and 88-temple Buddhist pilgrimage trail. We were drawn to the island for its history of indigo farming and washi paper-making. It is also a jumping-off point for exploring the spectacular art islands of the Seto Inland Sea. We have designed a rich, wide-ranging itinerary, which is both forward-looking and rooted in tradition. It will appeal to people with a broad interest in art, craft and design. Seldom visited by tourists, Shikoku epitomizes a more laid-back side of Japan. Traveling in autumn, we will enjoy brilliant fall foliage and crisp weather. Our exploration of traditional handcraft is focused on indigo farming and dyeing as well as washi paper-making. We are excited to include three full-day workshops in our itinerary. 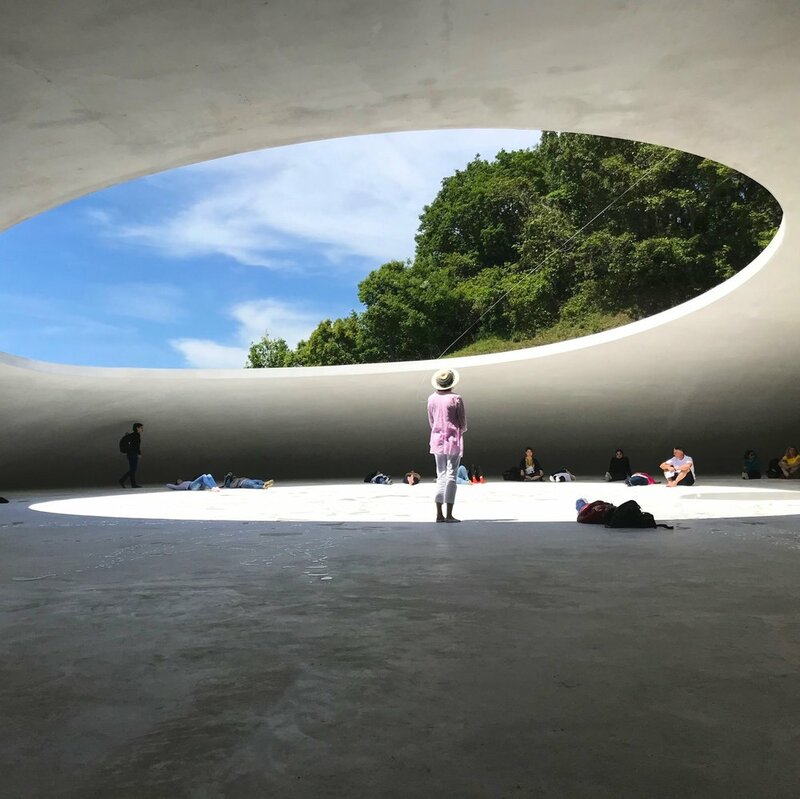 Our exposure to contemporary art and design includes visits to Naoshima and Teshima, home to innovative art installations by world-renowned artists set against a serene island backdrop. Our tour begins in the port city of Takamatsu. We will be introduced to Japanese aesthetics with a visit to Ritsurin Koen, a famous Edo-era garden, and we’ll tour the home/studio of mid-century Japanese-American artist and designer Isamu Noguchi. For a look at traditional crafts from the area, we’ll visit a seventh-generation dyer, who specializes in a paste-resist technique used to make flags and banners (pictured above). We’ll also learn how kagari temari are made. These traditional handmade toys are embroidered with dazzling geometric designs. Takamatsu is our base for exploring the art islands of the Seto Inland Sea, which we’ll reach by ferry. Exploring Naoshima and Teshima by electric bike, we’ll experience breathtaking art installations by world-renowned artists while getting a glimpse of tranquil island life. On our way to Tokushima, the next stop on our tour, we’ll enjoy a night in a modern Japanese ryokan. “Japan Blue,” as indigo is known, is the official color of the 2020 Olympic Games logo, and we will gain an immersive, hands-on appreciation for the color, which has deep roots in Japan. Indigo from Tokushima is known as awa ai—awa is the old name for Tokushima and ai is Japanese for indigo. Most Japanese indigo comes from Tokushima, where it has been grown since the Edo period. We will visit an indigo farmer, meet an indigo artisan, and participate in a full-day indigo dyeing workshop at a renowned atelier, learning shibori and/or katazome techniques. We will also visit an established paper-making company in the area where we will spend a day dip-dyeing handmade washi with indigo. 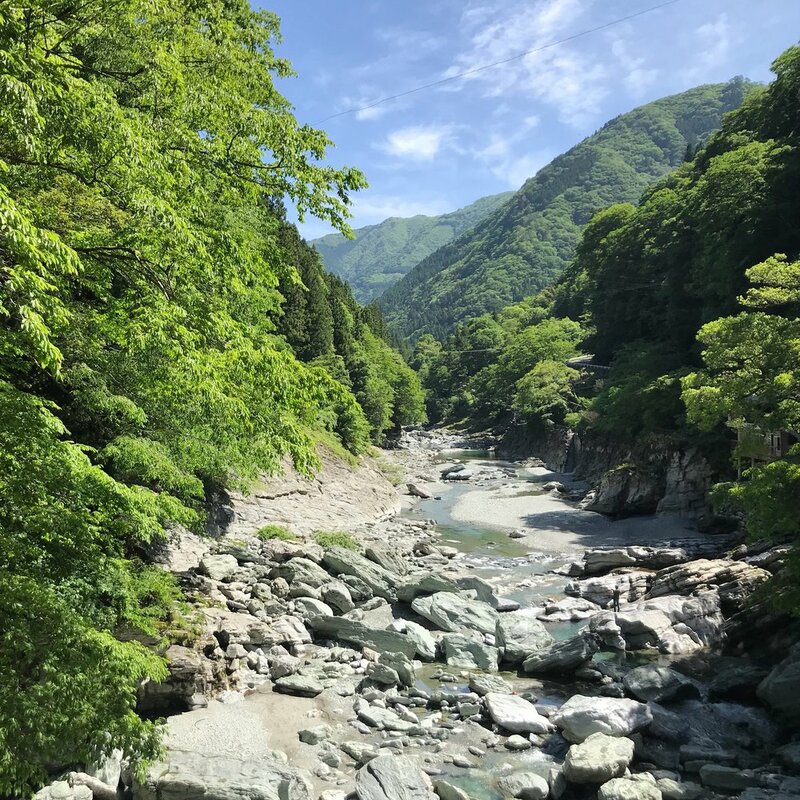 Our next stop is the remote, mountainous Iya Valley, situated in the heart of Shikoku. The valley is known for its steep, misty gorges, clear rivers and historic vine bridges, which link the area to its past as a secluded hide-out for defeated warriors (The vine bridges could be cut in order to escape pursuers.) We’ll enjoy spending the night in a thatched-roof farmhouse, typical to the area, which has been converted into elegant yet rustic accommodation. We will sleep on tatami and enjoy a home-cooked dinner surrounded by lush forest. We’ll spend a day exploring sights in the area, including visiting one of the valley’s famous vine bridges and learning to make soba noodles. We’ll also meet a woman with an unusual, community-centered craft project. In Kochi prefecture, we’ll gain insight into the ways in which Japanese artists and designers—past and present—have utilized natural materials in their work. 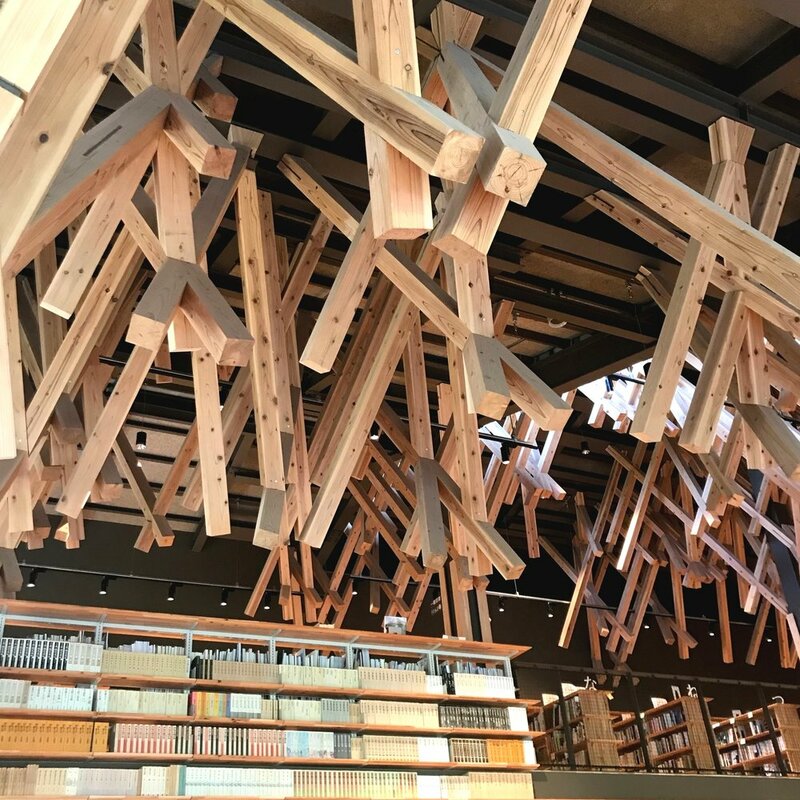 The idyllic small town in which we’ll stay boasts several architectural works by Kengo Kuma, one of Japan’s most significant architects and designer of the New National Stadium for the 2020 Olympic Games in Tokyo. Kuma is renowned for his craftsmanship and for the way in which he uses wood in his designs, which we’ll be privileged to see. We’ll also spend a day at the home and studio of a washi paper artist, whose work has been commissioned for Kuma’s interiors. Here, we’ll enjoy a hands-on introduction to the traditional Japanese art of making paper from natural fibers. The tour ends in Matsuyama where there is an airport to connect you with the next leg of your journey. November 11-21, 2019 - SOLD OUT! Our accommodation is an eclectic mix of “business hotels,” converted boutique guesthouses, and modern ryokan, where you will experience a traditional kaiseki multi-course meal and have the opportunity to soak in natural hot springs, known as onsen. Some shared accommodation will involve sharing a room in a converted house or a cottage and sleeping Japanese-style on futon. This is a quintessential Japanese experience for curious travelers! Our ground transportation consists of two private mini-vans and we will travel by ferry to the art islands. Please be aware, in case you suffer from motion sickness, that we will be driving on winding mountain roads between destinations. On Teshima island, you can choose to see the island on electric bike. The tour starts in Takamatsu and ends in Matsuyama. Please let us know if you need assistance booking domestic flights at the start or end of the tour. Another highlight of the tour will be enjoying regional Japanese cuisine. Please note that Western food choices will most often not be available. Tipping is not a custom in Japan and is not necessary. Instead, you may wish to bring small gifts from your hometown. Please note that we are traveling in late autumn when fall foliage is at its peak—these photos were taken in spring.